— A small program written in Java that makes it easy to embed a H.264/AAC video into a swf file. Only downside is that the flash must be fully downloaded before playback. SwfH264_v1.1.0.rar (25.4 MiB) — Extracts to 45.6 MiB. Designed to run on Windows but you can probably use it to make a swf with an embedded flv on all platforms. Requires Java 7 or higher. If the program doesn't start, right-click "! Run SwfH264.bat" and select Edit to open it in Notepad. You can also try changing -Xmx5000m to something lower, like -Xmx1000m, or removing it completely. Pressed "-- SUBS --" and added some subtitles. For this example I inserted the subs directly inside the program but it is recommended that you instead create a .srt file in a proper subtitle tool and then import it into SwfH264. It's not only more comfortable and less guesswork with the times but that way you can also save your subs and continue later. Closed the subtitles window and filled in some information. You should always give source of the video in the flash! This appears shortly after pressing the "Go!" button. Press save to actually write the flash to disk. UPDATE: You can now use The Swiff Army Knife to make the FLV file. I recommend you use The Swiff Army Knife because it has more refined options for ffmpeg (and you don't have to work with the command line yourself). I plan to eventually have The Swiff Army Knife replace SwfH264 completely. The whole point of this program is to embed a H.264 FLV into the flash so you shouldn't use the FLV Maker. Instead we'll use ffmpeg.exe to encode the video (the program is included when you download SwfH264). 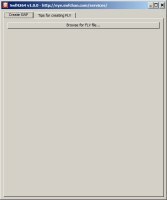 A "flv.bat" file exists, right-click it and select Edit to open it in Notepad. 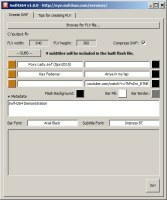 This should be modified to create the FLV that you desire. When making "Foxy Lady.swf" I kept the default settings and only changed -vb 1250k to increase the video's bitrate, -r 20.0 to make the video 20 fps and scale=-1:ih*0.50 to halve the dimensions. There's a tab called "Tips for creating FLV" inside the program. 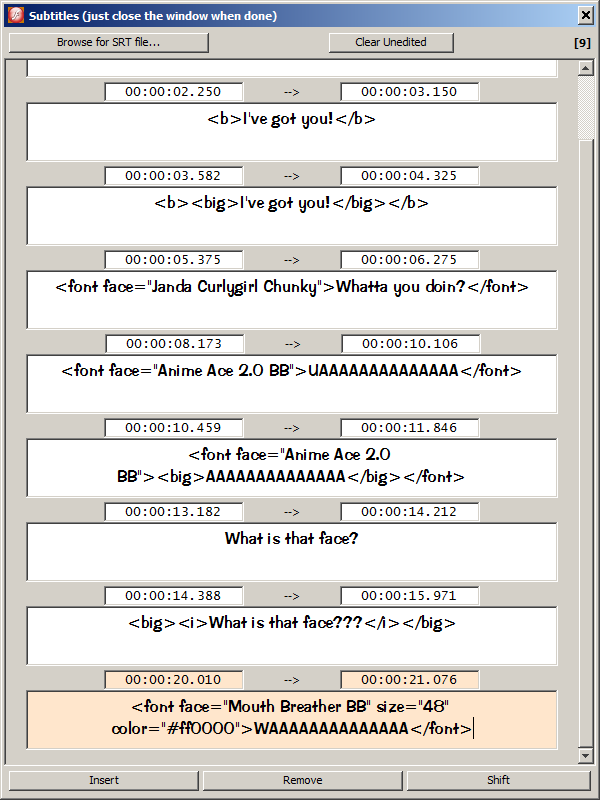 You can read its content in the textarea below (the command lines of "flv.bat" is also there). A/D or left/right: Seek to previous/next key frame. W/S or up/down: Increase/decrease volume. Right now there is a, usually, small delay when the video repeats. If that little gap was removed the program could be used to create proper swf loops with perfectly synced audio. If the video can loop seamlessly it would be possible to create proper swf loops with a seperate audio track that isn't synced with the visuals. Right now things are a little sloppy but it works. Currently you have to download the whole video before you can start watching it in the flash. I suspect there is a way around this, possibly by putting lossless images into the main timeline that are filled with bytes from the video. Then as the flash is downloaded these small chunks of the video is extracted from the fake images and gets added to the video stream. Sometimes certain letters in the subtitles become smaller or larger than the rest, depending on the dimensions of the flash. They recover at certain dimensions of the flash but it would be nice if this issue can be resolved. Being able to cut out/put together parts of a video or balance the audio volume. Being able to create that final FLV file from inside the program. As long as they can be decompressed in ActionScript 3 it would be possible to add another layer of compression to the video, if it would reduce the file size even further. Closing the program to continue later. Since the program can import a .srt file it might as well be able to export one too. Having a clickable seekbar to be able to jump in the video using your mouse instead of the keyboard. Menu of named chapters which takes you to a certain point in the video. Could be used to export several episodes as one combined video and then presenting the available choices of episodes to the viewer. If there's a seekbar the chapters could be red vertical lines that display their name when hovered. Pressing 1234567890 to seek to a certain percentage of the video's duration. Better GUI for inserting subtitles. Maybe even a "timer button" which allows you to watch the video and then press the button to start/end subtitles. Maybe have a selection of different preloaders to chose from? Could change in type as well as just color. Some videos have different audio/video streams. Might be good to mention how to grab the one(s) that you want for your FLV. To be able to do a quick CTRL+F kind of search in the added subtitles. To be able to CTRL+Z in the subtitle text areas. How to extract a .srt file from a video to be used in SwfH264. + SwfH264 will now parse the FLV upon import and setup the metadata itself. + Now able to pause and rewind videos that don't have seeking due to incorrect metadata. + Now asks you to confirm when exiting the program. + Updated FLV creation tips (reworked due to SwfH264 now handling metadata itself, changed scale width to -1 and added some on audio frequencies). + Bundled font Meiryo can now be loaded (couldn't before due to its file extension being in upper case). + Darker default colors for the source bar. + Inserting a new subtitle will now highlight it and make sure it is in view. + Source bar is now further up and is larger with a bigger font. + Video frame rate, resolution and duration is now included in the flash meta data and linebreaks are represented by <br> in the metadata instead of actual linebreaks. Questions or comments? Want an update? Please post about SwfH264 in its discussion thread.